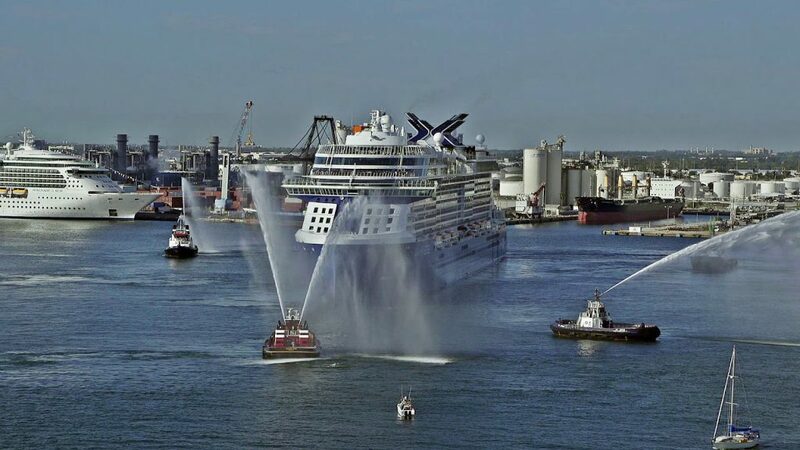 Celebrity Edge, the newest cruise ship to call Port Everglades home for the winter cruise season arrived to a huge water spray display, and the blasting of horns from the other ships in the port. It’s a most unusual looking vessel, with a rather blunt bow and an appendage on the side of the ship that has a literally movable feast. That orange appendage is whimsically called the Magic Carpet. It can function as a dining room, dance floor, meeting space. It will be interesting to see how that feature plays out in the future, as weather and guests’ acrophobia may be factors.